Mick Ronson had the paint removed from the front of his 1968 Black Beauty by one of Michael Chapman's roadies during the recording of "Fully Qualified Survivor". Mick thought that would make the guitar even more "edgy" than it already was. Sometime in the 80's he gave this guitar to Hard Rock Cafe in Australia. The neck had broken so many times that it was unrepairable. A rumor about Ronson's stripped Black Beauty is that the body of the guitar had a steel plate installed inside, which might explain the major sustain in Ronson's sound. 1968 Gibson Les Paul Custom - Black with stripped front. It was a 1968, not a 1958. Thanks Alex. Revised per your correction. Bravo! Thanks for posting this. I'm glad I know this because I feel only guitars like this should be displayed, --ones that are unrepairable and unplayable, but still intact enough to enlighten and educate people about their famous former owner(s). 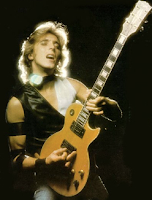 Especially, in this case, about Mick Ronson, who is a vastly underrated guitar player, IMHO. Other vintage instruments, IMHO, should be in the hands of musicians, as long as they still play well and can be repaired and maintained. Why do Stradivarius violins sound so sweet and nice? Because not only are they well constructed but they have been played by dedicated musicians, in some cases, for centuries! 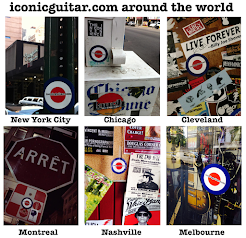 I hate guitars shops that have perfectly good instruments hanging on the walls like decapitated deer head trophies --I'd rather see and hear them in the hands of a musician! Even if it ain't me! Peace.